I had red/green/blue three led on MSP430G2553 port, if i want to control three led in different pwm at the same time.What can i do? Been awhile now since I have used an MSP430 and only every used 2 independant PWM, I know 3 is possible though and the link below might help in setting it up. Thanks, It’s very useful. One question. From your example 2, your clock is 8Mhz, TACCR0 = 200. You said the PWM frequency is 40Khz. Isn’t it 20Khz as 8Mhz/(200 * 2) = 20Khz? 200*2 = count up and down. Can you please clarify that? Never mind. You are using count up mode so it is right. Hi. I had tried Timer Example 3 on CCS an IAR and I’d obtained hex codes. There is not problem so far. But When I loadet it on proteus I wasn’t able to see results. No results on pins. What is the reason? Can anybody explain this to me? Thanks Sir! You helped me a lot! No worries and glad it was useful. to follow the cookie as I am of the old school(cookies are to be eaten, gay is happy, etc.). Anyway, I appreciate the clarity and thoroughness of your work. i want to count heart beat for 1 minute using counter and timer can you help me with the code please.. I have a frequency counter example using a Stellaris on the website, a similar setup can be used on the MSP430. The below post is originally for the MSP430F550x series, but I contributed some code for a MSP430G2553 frequency counter. Set the sample period to be a fifteen second period, add the samples up and then multiply by 4 and you then have a beats per minute (bpm), you could change this to one minute if required. If you have this you can then try different sampling periods and averaging, or sample for 4 fifteen second periods and just add then together. Thanks for the nice tutorial. I am using MSP430F5438A. I have a question regarding it. 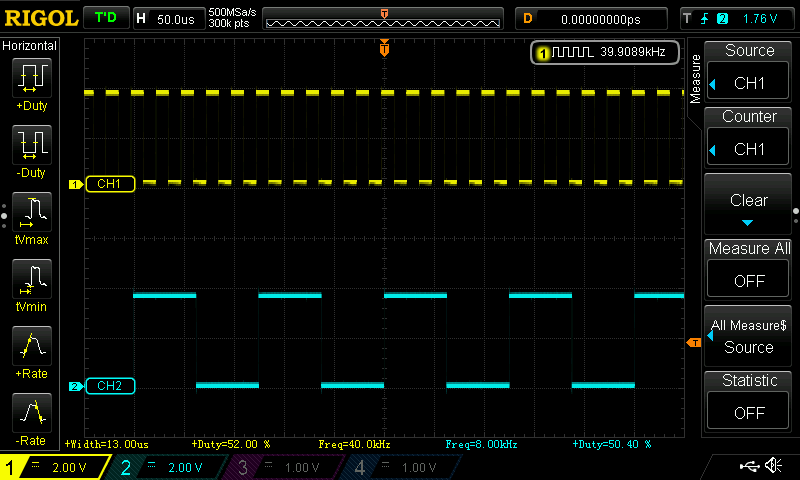 I got the idea about generation of PWM signal using timer A. But, if I ended the program with an endless loop, LPM0 or a command LPM3, does the output will vary? please let me know if possible. Thanks. The timer should still run as when you send the CPU into low power mode the timer can still run the PWM. Thanks for the comments and information about Adfly. I was not aware there might be phishing links associated with Adfly or unwanted .exe file downloads. I have a bit more time now and considering updating all the links and removing Adfly, your comments make me think I need to do this sooner rather than later. It’s not easy as like posting all the information but takes a fair amount of time putting it altogether, I just wish less people used Adblockers, as all the free content out there often relies on this as a small source of revenue (that’s my little rant). How can I control a servo motor(pulse cycle=30ms ; pulse width=1.5ms to 1.92ms)using msp430g2553. If its a single pulse you could pull a pin high for a time determined by a timer and the low again once the count is reached. There are basic examples that come with Code Composer Studio which can be modified. How can i generate a sine wave from this ? This link may prove useful as a full tutorial and code, you need to use some external opamps as well. its really a nice tutorial. i want find the pulse width continuously which is generated from the function generator. please suggest me what kind of method can i use. Enable a port as an input and interrupt enabled to trigger on the leading edge of the pulse. When the interrupt is initiated start a counter, you will then need to wait for the leading edge of the pulse and once this triggers a further interrupt, stop the counter. The count value will give a good indication of the pulse width, there will obviously be some inaccuracy as there is a certain overhead of clock pulses due to the interrupts being serviced. If you have the microcontroller running at at a faster frequency this will help service the interrupt quicker. A well calibrated clock source and good understanding of the clock cycles overhead will also help with accuracy. I am unsure what frequency of the pulse you are measuring, but you will need to store the count value somewhere or it may get over written, or possibly take multiple readings and average them. its an great work, i really appreciates your effort. but i try to download the full code with different browsers but its not opening. Can you provide any other link. I really want to know all the instructions for PWM generation. Hi, I sent them on to you. Great Post. Can i use Timer1 to count the rising edge of Timer0? Lets say i want to output a pulse of 50us for ‘1’ bit and 100us for ‘0’. So if i set Timer0 to 40KHz and duty cycle of 25us. I can count two rising edges of Timer0 for ‘1’ bit and four rising edges for ‘0’. Is this possible? I think you would be better off writing a function to perform this task, then manually tune the GPIO timings to perform what you need. Not sure what your end application is or what trigger you need to perform this pulse, but you can use an interrupt to monitor a port pin and act as required. Ok this is bit more information than before and sheds some more light on your problem! This is basically a protocol with a bit stream of data to control various assets for a model railway. These two links provide more detail about the protocol, timing diagrams etc. I would first research the protocol a good start is the links I have provided, see if there are any existing microcontroller examples you can find that other people have implemented and you can learn from. I would probably post a question on the 430h forum, but do some research first and show some willing to actually understand the issue and possible solutions. For any question provide background information so the reader can quickly understand what you are trying to do, some images from the PDF links will definitely help with that. I think as far as coding a timer is not the way to go, bit banging or the use of the USI or USCI module is probably preferable. I only have limited experience of using the USI and USCI, although I intend to change that over the coming months, so your best bet for advice on this would be the 43oh forum. Is it possible to do frequency comparison using the capture mode(Compare it with a preset frequency for a minimal time of 100ms) and cause interrupt if there is any change between the frequencies?? If yes, give me some idea on how to do abt it..
You should be able to capture pulses and I have code for the MSP430 in my debounce tutorial, counting them and then calculating the frequency is not difficult and a basic example is shown in my Stellaris frequency counter tutorial. However instead of displaying the frequency you want to compare that frequency against a set value or ensure it falls between two values to allow for any inaccuracies in your readings and give the system a tolerance. Then it is falls within your desired frequency nothing happens, if it’s out generate and interrupt or use some other flag. Thanks for your reply, I did try your suggestion for past two days but in futile. The basic problem I faced is in the allocation of registers(Setting up the counter for rising edge, and setting another timer for 200ms and stoping the counter etc.) I tried to understand it from the datasheet but I did not find the bit wise allocation procedure( I am using MSP430fr5969). Could you suggest some way that I could get out with?? A) The debouce tutorial part 1 has some basic code for counting falling edges, I would confirm you can get this working and adjust for your leading edge. copy the value held in the count register of the ‘A’ code into a variable then reset the count register for ‘A’ to zero. Using the copied count value you can then calculate the frequency and use this to carry out the rest of your code. The counter register is cleared and begins to count again until the interrupt is generated and the process begins again. You will need to tune it for accuracy and note your maximum frequency as the counter will only hold a certain value, which is dependant on how quickly your timer interrupt fires. Very useful tutorial for some one brand new at this. I am using a MSP430fr5969 for a robotics application that requires the use of two servos. Since the board only has one hardware pwm, i think i need a piece of code like this to generate a software pwm on a second pin. First I am unsure of how to combine your .c files and my main code i wrote in energia together. Good you found the tutorial useful. I have not worked with Energia as wanted to understand the MSP430G’s from the ground up, Energia is very good so I have heard but you are a little removed from what exactly is going on in the registers. 1) I am not sure how the Energia code and any C code will interact, but I would have thought if the Energia code sets up a timer in a certain way, then the C code is executed and changes that timer the last executed code will take precedence. No guarantees this will work but try using Energia to set-up the 1st PWM check it works, then use the C code for the 2nd and test again, bit of trial an error here but might be your best route, just break it down and test each step so you can then trace back to where the error was introduced. 2) Energia should have a guide explaining how the functions work, it’s based on Arduino libraries which have similar guides or comments, finding this is not always easy but there must be a wiki or something similar. As far as the C code register commands for the MSP430 series find the family guide and look through the relevant peripheral sections, I have listed some in the tutorial. The code can appear cryptic, but if you look in the family guide it does explain how each register is used. My other guide on programming the MSP430 may be of use here, as a good understanding on bitwise operations in C will help. I believe the paragraph headers for Timer_A Capture/Compare and Timer_A Capture/Compare Control should be switched. This change needs to be propagated through for registers 0, 1 and 2. Thank you very much for the feedback and pointing that little mistake out, I have amended the paragraph titles. How can I set the timerA in a continuous mode? for example, to get a sequence of 4 pulses (10, 70, 90 e 20%) repeats at 4 Mhz every 0,25ms. Fclk= 2MHz. I want to know which values go to TACCR0, TACCR1 e TACCR2. How can I calculate them? It sounds like an unusual application. I guess you need one timer to generate the PWM frequency, then a second timer to generate an interrupt every 250uS. Inside the interrupt place your code to change the counter which determines the duty cycle. If you need the duty cycle to change at a precise time, then you may need to have the timer interrupt fire every 240uS, which will then allow the duty cycle code to execute and update. This will be a bit of trial and error, but using an oscilloscope will help you capture the pulse timing to tune it. Well if you look at the MSP430G2553 for example which comes with the basic launchpad, browsing the datasheet look at the ‘Terminal Functions’ section which lists each physical pins functions. The link below will also help clarify the MSP430G2553 capabilities. Failing the SMD version I would look at one of the MSP430F family Launchpads. The explanation was fantastic..I loved it…It would be really helpfull if you could make me avaliable with the full code of the above examples..I am not able to access it in the link provided.. Thank you !! Glad you found them useful, all the links work 100% please check your browser is not blocking Adfly. If it is you can try and open the link in another browser, I have the links as it helps to pay towards the hosting costs for the site.